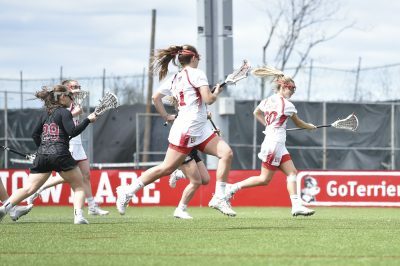 The Boston University women’s lacrosse team will look to start off conference play with a win Saturday afternoon, when it plays Lehigh University at Nickerson Field. The Terriers (2-3) are coming off of an 11-10 road win against Fairfield University. BU trailed by two at the half, but senior attack Avery Donahoe led the team in the comeback with five second-half goals. She now leads the team with 14 goals. Donahoe’s final goal on the day gave the Terriers a 10-9 lead with 2:46 remaining in the matchup. However, Fairfield sophomore midfielder Meaghan Graham found the back of the net just 55 seconds later to knot the game and sent the Terriers into overtime for the first time this season. The game was eventually decided in double overtime, thanks to a goal from junior midfielder Kelly Mathews, her sixth of the season. The goal was assisted by sophomore attack Kailey Conry, who leads the team with 25 points. The win came in the team’s final of four consecutive road games, and BU will return home briefly Saturday before hitting the road again for two games. BU has played a series of tough non-conference matchups leading up to Patriot League play, and head coach Liz Robertshaw said she believes these games have prepared her team for meaningful conferences games in the weeks to come. Conry and Donahoe have been leading the team on offense so far in the young season. Conry has already gathered 15 assists, good for best in the league. Donahoe has already collected three hat tricks in five games and will continue to play a crucial role on BU’s offense. Defensively, senior defender Maria Guerra is tied with senior midfielder and defender Sarah Andersen to lead BU with seven caused turnovers. In Wednesday’s victory, the duo each had two caused turnovers, as well as a combined seven ground balls helping to limit Fairfield’s offensive opportunities. Despite the positives, BU is currently eighth in the league in goals per game with 11, and ninth in shots per game with 26.2. Additionally, BU has won just 58 of 141 draws at the faceoff X so far this season, and Robertshaw hopes this number improves going forward. Lehigh (5-3) is currently in the midst of a three-game winning streak. The Mountain Hawks’ last win came last Sunday, against Fairfield (4-4) as well, where they earned a narrow 12-11 victory. Lehigh is led by a handful of scorers, including junior attack Kellie Gough, who has scored 18 times so far this season, including a hat trick against Fairfield. Other top scorers for the Mountain Hawks are junior attack Courtney Henig with 14 goals and sophomore midfielder Sondra Dickey, who leads with 22 goals. Lehigh’s freshman goalkeeper Samantha Sagi, has started all eight of the Mountain Hawks’ games and is fifth in the league with 10.97 goals allowed per game. BU’s senior goalkeeper Christine Laible has made a total of 35 saves, and allows an average of 15.97 goals per game. In the double overtime win against Fairfield, she played every minute and made 12 saves, with a save percentage of .545. The Terriers have finished above .500 in conference play for four years in a row, and they will look to get off on the right foot this year. BU is hoping for some revenge against Lehigh on Saturday, as it narrowly lost by the score of 13-12 just a season ago.